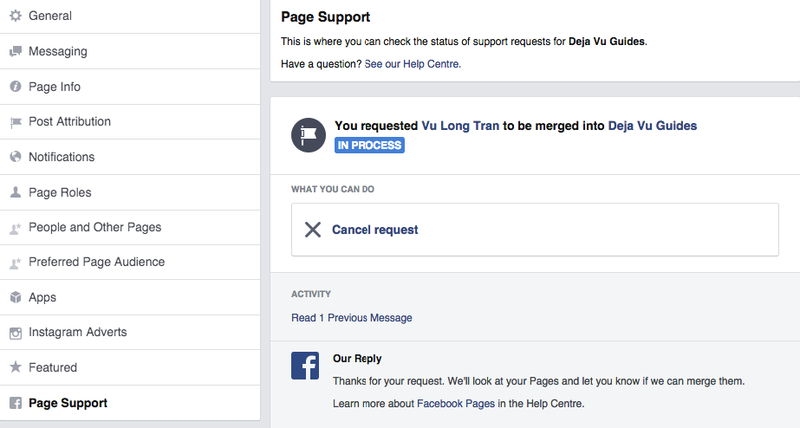 Here’s my walkthrough of how I merged a couple of my Facebook pages together. I originally received the following messages when I looked to merge my Facebook Pages, but after making some consistency changes, I was provided the option to Merge. Here’s an example of the details that they will ask you to review and confirm. If you are an admin of multiple Pages that represent the same thing, we may be able to merge them. Merging Pages combines all of your likes and check-ins into one Page. 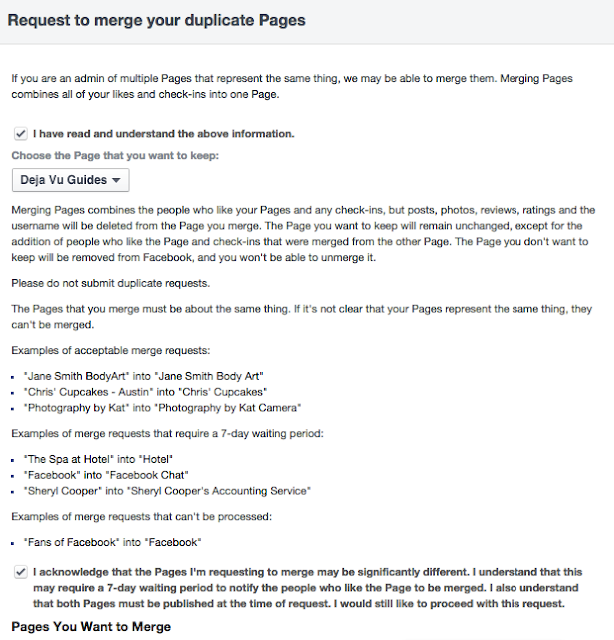 Merging Pages combines the people who like your Pages and any check-ins, but posts, photos, reviews, ratings and the username will be deleted from the Page you merge. The Page you want to keep will remain unchanged, except for the addition of people who like the Page and check-ins that were merged from the other Page. The Page you don’t want to keep will be removed from Facebook, and you won’t be able to unmerge it. Please do not submit duplicate requests. The Pages that you merge must be about the same thing. 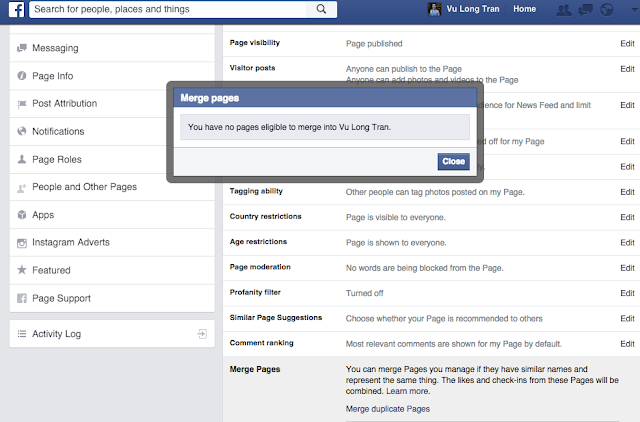 If it’s not clear that your Pages represent the same thing, they can’t be merged. I acknowledge that the Pages I’m requesting to merge may be significantly different. 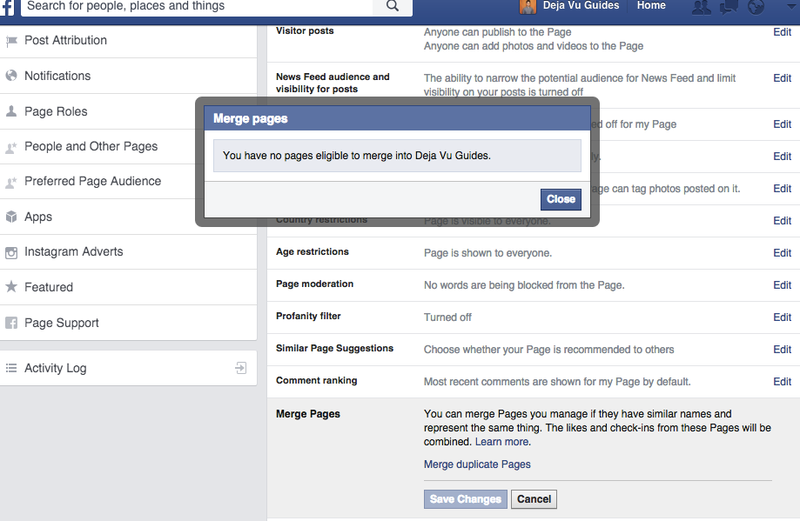 I understand that this may require a 7-day waiting period to notify the people who like the Page to be merged. I also understand that both Pages must be published at the time of request. I would still like to proceed with this request. Use the drop-down menus to select up to 5 Pages you’d like to merge into your destination Page. You can only mergePages that you manage. After we process your request, likes and check-ins will be combined on the destination Page. All other content such as posts, photos and the username will be permanently deleted from the Pages you merged. Please review this request before submitting. Once your Pages have been merged, it cannot be undone. Do not submit multiple requests. 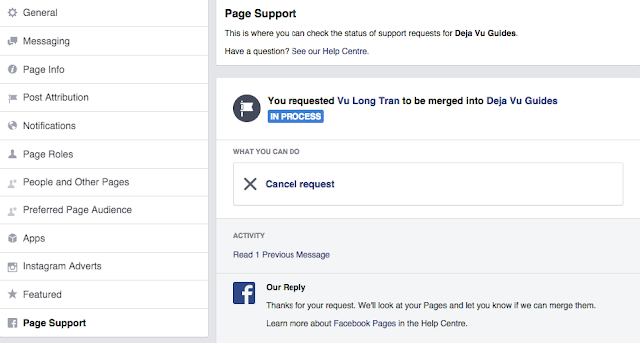 If you accidentally submit a request, wait until you hear back from the Facebook team. Submitting another request could result in all of your Pages being permanently deleted. Submit your request when you’re ready. Please submit only once. Right now, I am waiting for https://www.facebook.com/dejavuguides to become my main Facebook page.